As I got out of town car that drove me to the Central Plaza Building the numbers repeated in my head, 11, 23, 36, 57, 72. 8:30am that morning I had gone down to the buffet in the hotel and collected a total of 5 banana, I sat and ate 3 of them and the numbers repeated in my head, 11, 23, 36, 57, 72. When I entered the elevator in the lobby to made my way back to Sky Lobby on level 46, pain of last year run was fresh in my mind. When the elevator doors opened I was greeted by a familiar face, I cannot believe I have familiar faces in cities around the world. Patricia and I discussed our lives over the past year as we strolled past the stages and booths and looked at the organisers set up area. At 11:45 am people are having an early lunch as I consume my 4th and 5th banana and enjoy good conversation with the media and Sino group staff. I had just taken off my new Dwayne Fernandes logoed T-shirt and add my number, X-21 to Sino Group T-shirt. I also I set up my music check it twice. 5 and half songs and I should be at the top. 12:30 pm photo shoot and get collect for the run. As I start stretching, I notice there were more runners this year, I got told by Karen that my interview last year helped. She advises me that Corporate donations were up as well. We make our way down for 12;45pm start, It felt hotter than last year. I did feel fitter than last year as the last few weeks were busy with reports to write and a change of jobs. Then I repeated the numbers in my head, 11, 23, 36, 57, 72. I knew I would be fine. After spending 10 mins with a pen, paper and playlist I had determined my goals, I broke the building down! I now could see the tower in doable sections. I organized the run via songs, at the end of the first song I should be at least on the 11th floor, and the end of second on the 23rd floor, then 36th, then 57th, then 72nd and finally at the 75th floor, being the top of be tower. The numbers repeated again,11, 23, 36, 57, 72 finish. At 1:05 pm I was standing at the starting line and everyone around me was counting down- 5, 4, 3, 2, 1, Go! I clicked my music and ran towards the stairs, I now know this tower, she zig and zags for the first 10 floors and steadies into a right turning rhythm. I turned quickly past the 11th floor and I notice my first song has not finished, that was good but expected so early in this race. So I keep my mind kept and kept climbing and using good techniques. I clamber past the 23rd floor, my second song was half way through, I smiled and was happy to find myself keeping a good pace. With my third song coming to its end the 36th floor was one below me and now I am at the half way point, feeling like my lungs are on fire and legs and arms hurting I knew there is only 1 exit in my mind. 75th floor here I come! I grabbed and pulled and my feet followed, I kept pulling myself up and my feet kept following, soon I was going past the 72nd floor and I was still ahead in my song knowing there was only 3 floors to go I did my most to make sure I beat the end of the song. As the cool air hit me and I finished the final flight of stairs my song ended. I was standing on the finish line mat as “you give me something” by Jamiroquai started to play. I caught my breath and realised there was nothing left for me to do but dance, so I danced. I had done better than I have expected, I was supposed to be up here half way in this song that would have been about 26 mins. 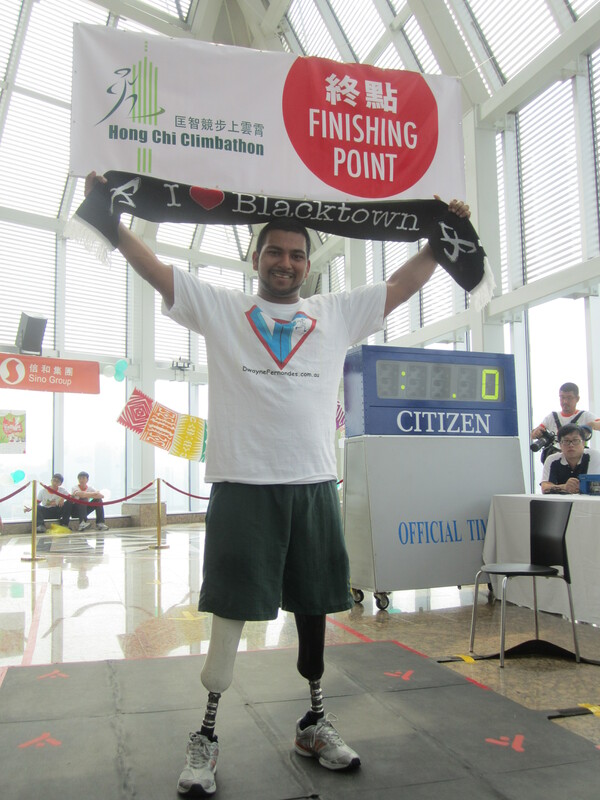 I had just climbed the Hong Chi Climbathon in 24;59 mins a 3 minute improvement on my hardest tower climb, I can live with that improvement.